Summary: In 2012, Beck Dorey-Stein is working five part-time jobs and just scraping by when a posting on Craigslist lands her, improbably, in the Oval Office as one of Barack Obama’s stenographers. The ultimate D.C. outsider, she joins the elite team who accompany the president wherever he goes, recorder and mic in hand. On whirlwind trips across time zones, Beck forges friendships with a dynamic group of fellow travelers—young men and women who, like her, leave their real lives behind to hop aboard Air Force One in service of the president. Over the past few years, I've become a bit of a political junkie. I turn on cable news every morning as soon as I wake up, and I usually fall asleep to the same station at the end of the day. 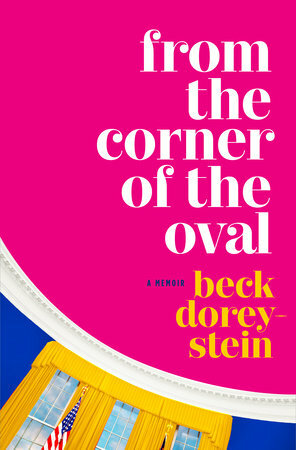 So when I saw Beck Dorey-Stein, author of the new memoir FROM THE CORNER OF THE OVAL, doing rounds on television promoting her book about working as stenographer in the Obama administration, I knew I had to read it! FROM THE CORNER OF THE OVAL tells the story of Beck Dorey-Stein, a recent college graduation who is working multiple jobs just to pay her rent in DC. When she applies for a position listed on Craigslist, she has absolutely no idea that it's for a job to work as a stenographer for Obama. (Isn't that incredible?) She winds up being part of a very prestigious team that travels everywhere with the President's entourage, and her story about what she experiences are fantastic. Initially, I thought this book would be more of a tell-all about scenes behind the White House and the players in the Obama administration. And to a certain extent, it was... in a good way, not a scandalous one. Ms. Dorey-Stein definitely captured the essence of staff and the urgency of their work; and it was interesting to see how they all truly believed in the causes that they were pursuing for our country. And while I enjoyed the inside look at Obama, his staff, and their travels, especially the little stories about her encounters with the president, I think the strength of this book was Ms. Dorey-Stein's revelations about herself and her personal life. She ended up having a relationship with one of Obama's closest aides, and it was at times ugly. Needless to say, it didn't end well for her. In fact, I found the author's honesty to be refreshing, although I did want to shake her more than once for going back to this dog over and over again. Her revelations about her boyfriends (and her fling) were "no holds barred," and she had way of telling the stories about her love life that definitely kept things interesting. (Think really smart chick lit but true!) There were times when I just wanted to give this young woman a hug and tell her that things will eventually work out for her, although I had a feeling that she was smart enough to figure things out on her own. In many ways, FROM THE CORNER OF THE OVAL was a coming-of-age tale. I so enjoyed following Ms. Dorey-Stein's male and female friendships (she was so fortunate!) and how she navigated the politics of her office. However, this book was also a coming-of-age story about how the author became a writer. She knew she always wanted to write, and she constantly kept journals about her experiences (which sure came in handy! ); however, breaking through to becoming a published writer is a tough road. Ms. Dorey-Stein certainly has a way with words, and I look forward to seeing what's in store for her in the future. I thoroughly enjoyed FROM THE CORNER OF THE OVAL and recommend it to fans of memoirs, but also readers who are interested in politics and enjoy smart coming-of-age stories! I received an e-copy of this book from the publisher. I thought this would have a more political bent too. I look forward to reading it. I love reading political books. I highly recommend Who Thought This Was a Good Idea by Alyssa Mastromonaco!